Home / Information & Resources / Reports & Submissions / Reports / Counter Arguments – How important is tobacco to small retailers? 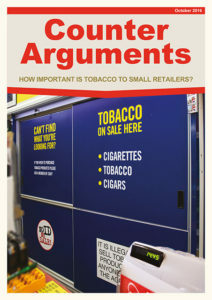 Counter Arguments – How important is tobacco to small retailers? This report scrutinises the messages sent to small retailers by the tobacco industry and asks whether the traditional approach to selling tobacco in small shops is still in retailers’ best interests, given the ongoing decline in the market and the recent changes to how tobacco is sold. The findings in this report are drawn from two new pieces of research: an analysis of Electronic Point of Sale (EPOS) data from a sample of 1,416 convenience stores in Britain and a survey of 591 owners and managers of convenience stores.